Lately I’ve taken some much needed down time, spending more time with my family and friends and taking a “breather” from work. Time away is always a good way to gain perspective and reflect on how to be more efficient, creative, productive and happier. 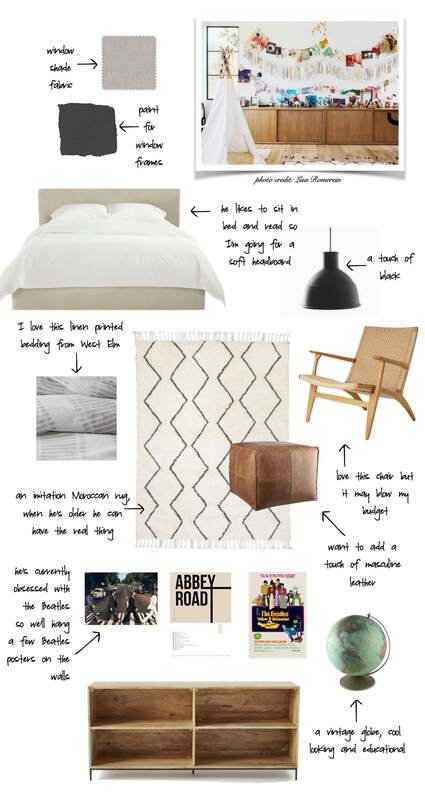 But I love interior design and it’s something that will always call me back. So, I’m now working on my son’s room (he’s 11 and as tween as they come) and looking for the right fabric to recover his chair. At first I went looking for a vintage chair but kept falling in love with beauties in the $3000+ range (like this and this). And let’s face it, that’s just too much to spend on my carefree but not-so-careful child. Then I found the chair below at HD Buttercup – I liked the wood, the woven cane and the $600 price tag. I don’t like the stiff cushions and since I planned on personalizing the chair with my own fabric anyway, I knew I could adjust the cushions then. My plan is to have my upholsterer remake the cushions with a down wrapped insert, this will be much softer and cozier than what’s on the chair now. My son does not like dark and dramatic colors (I know this because I painted his bathroom Railings by Farrow & Ball and since then he’s been taking his showers in my bathroom 😳) so I knew the palette for his room had to be “light and “bright.” I love Jenni Kayne’s modern yet warm aesthetic and I used her child’s room as an inspiration. 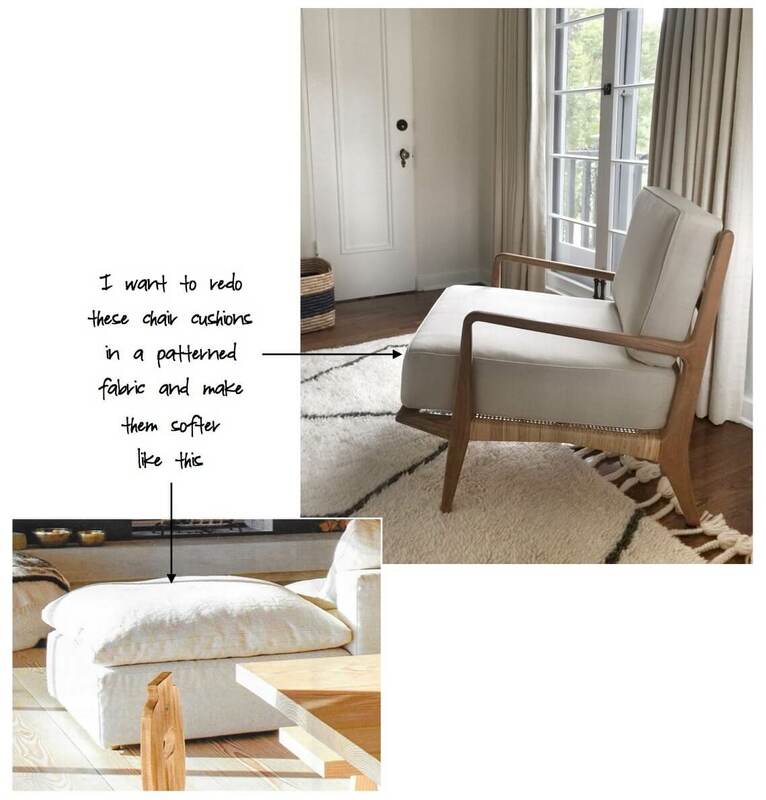 BED – I was going for comfort and simplicity, and the Wyatt Bed from Room and Board is both. Here’s a similar bed from ABC Home, but it has a hidden storage compartment. As far as wood beds go, this one by Pop & Scott Workshop is nice. BEDDING – Linen bedding is durable and I love the look so I chose this patterned bedding from West Elm. This and this are good options too. RUGS – Here’s the rug pictured above, it’s surprisingly soft and seems to mask dirt even though it’s primarily cream in color (we’ve already had a few accidents but they cleaned up quickly). I also love the bit of red on this rug and this one is super cool too. CHAIRS – Ok, I spent lots of time looking at chairs and ended up buying one I just happened upon. The chair pictured above is this one and here are several more that could work – this, this, this, and this. HANGING PENDANTS – This is the light I chose above and I also love the Hazel Pendant from Rejuvenation and the Hubert by Horne. POUFS – Here are several leather poufs that could work – this one (pictured above), this, this or this. BOOKCASE – I wanted a low bookcase and something with a warm, rustic looking wood so I selected this one. If you can’t find the exact one you want and are open to a custom piece District Mills is a great resource. ACCESSORIES – Etsy is a great spot for unique and/or vintage accessories. This and this are globes similar to mine which I picked up at Cisco Home. I’m still on the hunt for some great Beatles posters so let me know if you have a good source. In the meantime I’m considering something like this and this.